24/7 service | J.J. McLellan & Son "
This week we had a customer who needed their furnace checked and due to the cost of the parts, for them it just wasn’t worth it to repair an old heating system. After our salesman measured up and priced a system suited for their home and needs, our guys went to complete the retrofit. Watch for our van’s around town – this one happens to be our biggest and in my opinion best bill board advertising for our services. With 24 hour 7 days of week service we are always available should your heating system fail you or plumbing system back up, flood, leak etc. 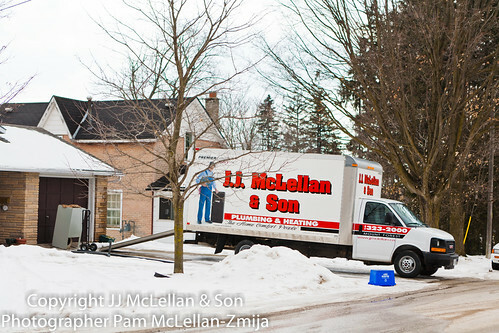 We actually had a furnace which quit for a customer on Christmas Day and were able to provide them with heaters until we got the new one installed Boxing Day morning and just one night this week we received a call at almost 10pm at night from a customer who had sewage backing up into their basement – their finished basement. This did require two guys heading over with our sewer flusher equipment, however the guys were able to clear the blockage and ease the home owners worries of more damage occuring over the night, they were able to sleep and tackle the damage in the morning. Here is our moving billboard !